Our industry lauds cutting-edge UX. Look no further than the exceptional work of Path. One either swoons over it, or one is blind. But what if that sends a wrong signal? Don’t get me wrong, I feel very strongly about the importance of UX, but since I’ve played around with NewsFlash, a feature-stripped free news app for iOS (iTunes link), I’ve asked myself whether more often than not users work for the UX, instead of the other way around. 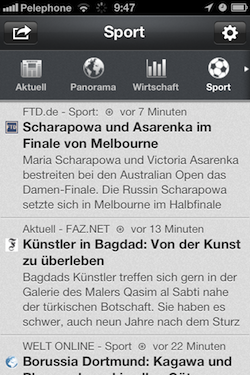 NewsFlash puts the ‘dead simple’ in ‘dead simple’… Swipe-scroll for a category, tap one, and boom, you get a feed of relevant news items. Swipe-scroll past the categories and you get to languages. Tap, and boom, same category, different language. Included are all the standard news categories, such as Sports, Business, Politics and Tech. And the app has built-in support for these six languages: English, German, Italian, Japanese, French and Hebrew. News sources change from language-to-language. For English, NewsFlash sources from The New York Times, The Wall Street Journal, The LA Times, Reuters, AP and more. 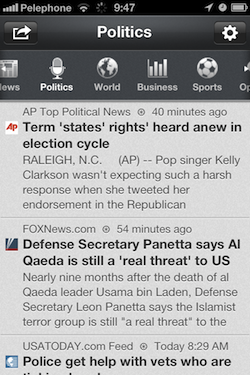 Also, I’d be remiss if I didn’t mention that the app fetches the news items really quickly. Definitely one of the more responsive apps I’ve ever seen. Remember the point I made earlier about working for the UX? Well, try NewsFlash, then try Flipboard for iPhone. Sure, they’re different experiences so we’re not talking about an apples-to-apples comparison. That said, it takes user effort (the flipping) to go through news items. Fun at first, but I find it exhaustive to use (speaking only about the iPhone version, the iPad version is a home run). NewsFlash’s UX is the complete opposite. One could argue it even looks outdated. And yet, it does exactly what it’s supposed to in the easiest way possible, meaning, with neither bells nor whistles. So if you’re a news junkie and want the UX to work for you instead of the other way around, NewsFlash is certainly worth a visit to the App Store.